According to Dr.Susan Heitler, relationship and marriage counselor, I quoted from Femina Indonesia, the use of technology especially gadgets can cause your relationship and your partner to crack. This is the reasons. Access to social media is getting easier and faster lately, so the opportunity to spill out trouble to the public sphere is getting bigger. If you are not good at holding back, all your friends on facebook or twitter might be aware of your household problems. Instead of getting a solution, you will be 'bullied', and the couple will not be happy. We think normal to chatting more often than calling or meeting in person.In fact, communicating with the article susceptible to misunderstandings because not accompanied by intonation. For example, you might feel 'cold' for just responding with a short sentence, while in fact, he is busy in the office. By calling and speaking directly, this problem can be avoided. 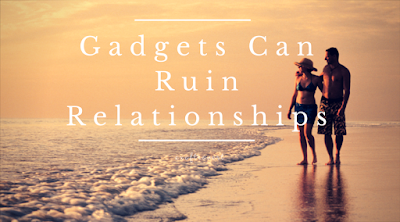 Every couple tends to be engrossed in their gadgets when meeting rather than chatting and exchanging stories.Often we see the incident when the couple was in the restaurant. Sitting face-to-face, but both looked at the gadgets. Ever experienced it yourself? Increases possessiveness and suspicion of spouses with the availability of 'spotter' location applications. Once you have installed this app, you will be tempted to monitor it. Life is not calm, time to do things productive also be reduced. Better, increase mutual trust by communicating directly.